Nats Beat reporter Jamal Collier posted another inbox; here’s how I would have answered the questions he took. Q: The Nationals and A’s have proven to be strong trade partners over the years, and I believe the A’s have a few players to fit the Nats’ needs. Do you think Washington could trade for Sean Doolittle and Stephen Vogt? A: We mentioned this in passing in the comments discussion recently; it does make sense to try to acquire Oakland’s closer Sean Doolittle. Acquiring Stephen Vogt makes less sense right now, given that the Nats have guaranteed Jose Lobaton money for 2017 and have signed Derek Norris to be the starter. For similar reasons as to why the “Nats are still interested in Matt Weiters” arguments make no sense, acquiring Vogt wouldn’t make much sense either. If you acquire Vogt, you tell the league that you need to trade either Lobaton (no options/5-year veteran who cannot be sent down and who has a guaranteed 2017 contract) or Norris, and it isn’t exactly the best way to go about maintaining a player’s value when the whole league knows you need to make a deal. That’s why we got very little in return for Danny Espinosa, and that’s why signing a third catcher to a guaranteed deal wouldn’t make any sense. The one issue that may be blocking a Doolittle deal is the farm system; as in, we’ve gutted it this off-season already. Billy Beane knows how valuable closers are; he just watched Aroldis Chapman and Kenley Jansen cash in and he has seen what the likes of Andrew Miller and Wade Davis fetch in trade. I’m not saying Doolittle is in that class of pitcher … but he’s not chopped liver. The price tag just may be too high for Mike Rizzo to consider. Collier says Doolittle would be a good fit, but that Oakland isn’t shopping its players right now. Q: Wilmer Difo is the only middle infielder on the 40-man roster, other than the starters. 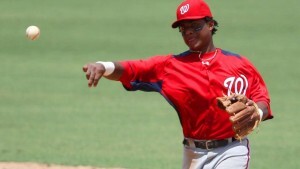 It seems to me the Nats need another infielder on the bench. Emmanuel Burriss seems to be the only other option. What do you think? A: Yes, the Nats definitely need another MLB quality backup infielder. Emmanuel Burriss is not that; he’s a 4-A guy who only played last year because Philadelphia isn’t really trying right now. Wilmer Difo is not the guy you want to be injury option #1 either. This is why I want Stephen Drew back, as discussed ad naseum in the comments recently. But I also admit Drew may have priced himself out by virtue of his 2016 performance, and it may be an outlier season. Who else is out there? Not much at this point. I think the Nats are kind of thin right now all the way around; if we lose any of these key players for any length of time, the alternatives are pretty poor. Imagine giving 400 ABs right now to Difo or to Michael Taylor? I mean, what does this team do if Anthony Rendon, not exactly known for being a rock heathwise, misses 2 months? Who plays 3B for that time? Matt Skole? I think the team needs a bit more depth both in INF and OF right now, honestly. Collier says the Nats are comfortable with Difo as a bench option, as evidenced by his presence on the NLDS roster. But I don’t buy that; i think he was on that roster as basically a 25th man/pinch runner guy, not because he had earned it. Q: The offseason trades seem to point to the Nats believing Stras is going to be healthy, why would they think that? A: Because he’s not the first player to suffer a Strained Flexor Mass, because its not nearly as severe an injury as other arm injuries, and because the team is probably hyper-monitoring Stephen Strasburg‘s recovery. Its basically a 1 month injury, 2 if you’re being really cautious. Had the Nats made the World Series i bet he woudl have pitched. I can’t imagine any reason he won’t be ready to go by 4-1. Collier notes that both he and his agent have said multiple times there’s no issues, plus Strasburg was throwing bullpen sessions in the post-season…. he’ll be fine. Q: With the trade to the White Sox, I’m concerned that the Nats have denuded their farm system of Major League-ready top prospect pitchers. In case of injury to any of the top six Major Leaguers, it seems that there will be no “next man up” to fill in. A: Me too! The Nats gave no less than 20 starts to pitchers outside the opening day rotation in 2016. That same number was 28 in 2015, 13 in 2014, 25 in 2013 and just 12 in 2012. So that’s an average of 19.6 “extra” starts per year thanks to injuries and unplanned absences. You’re absolutely right; the first two likely candidates to take those starts in 2017 (Lucas Giolito and Reynaldo Lopez) were both flipped for Adam Eaton. Now we’re looking at those starts going to A.J. Cole and to Austin Voth initially, and the pickings get slimmer from there. “Slim” as in, there’s only really 7 starters on the 40-man at all, so if you really get stuck you’re looking at Oliver Perez getting stretched out, or putting someone like Blake Treinen back on a starter routine. And past that? We’re talking a MLFA type like Jacob Turner or our own already-outrighted-once Taylor Hill. In reality we’d never get that far; we’d promote Erick Fedde or maybe hope that reformed knuckeballer J.D. Martin has something in the tank. But those are not really confidence-inspiring options. Here’s hoping for a healthy 2017 from the rotation! Collier acknowledges the same and thinks the team may sign some starter depth before spring training starts. 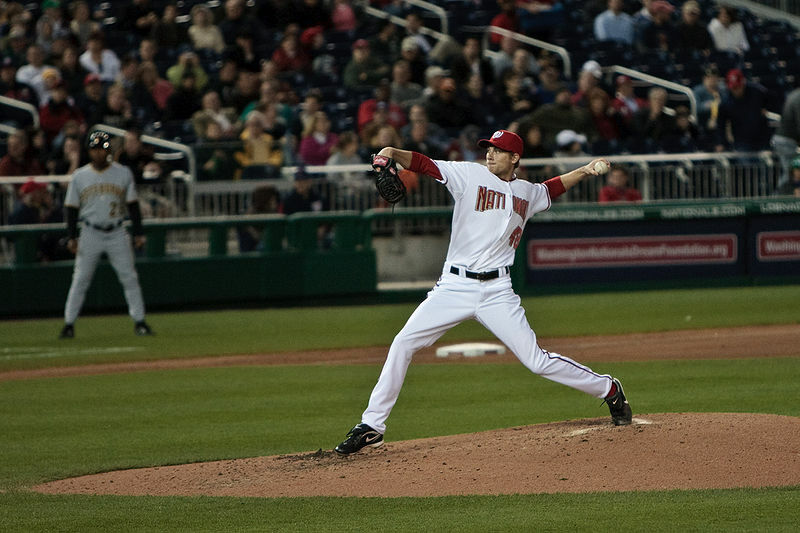 Q: Perhaps the Nats could bring in some veteran starters to Spring Training, like they did last year with Bronson Arroyo, to compete for rotation spots and as insurance in case of an injury. What will it take to get Trout? Sure he would like to play for a winnèr. A: See above, yes. 2016 Syracuse had some decent alternatives: Paolo Espino and Aaron Laffey both seemed to be good alternatives. Espino signed with Colorado, Laffey is still a FA. But there’s a slew of veteran FA starters out there who would probably take a non-guaranteed deal. I could see Mat Latos coming back b/c of his Dusty Baker connection. I could see an injury-case like Kris Medlen or Matt Harrison look at the SP depth and say to himself, “gee, I can probably beat out Cole and Voth for the 6th starter job!” So yeah you never know. Trout trade; that’s just internet click bait. He’s not going anywhere. Owner won’t trade him, and putting together a package of prospects to acquire him could never work out; it’d either be not enough for the Angels, or too much for the acquiring team. Collier tries to speculate on a package for Trout, coming up with Turner, Robles, Ross and perhaps Fedde. Think about that trade, what it would do to the current team, and what it does for the future of the team versus what you acquire, and ask yourself if its worth it. All our full-season squads have been announced, and its time to start looking at the pitching staffs. I never got to doing my massive reviews of the rotations of the various farm system teams this past off-season (job change, less free time at home, they being a ton of work, etc). Which also led to my not doing any predictions on where our pitchers would start the 2015 season. Which is a bummer, because it is always fun to see if my predictions were decent and to see how player movement has affected the squads. Lets go team by team and (focusing on the rotations) look at how things have changed since the end of last season. Discussion: We’ve certainly talked this through. Quickly; Fister‘s 2014 spring training injury opened the door for both Roark and Jordan to duke it out for the 2014 5th starter job, eventually won by Roark, who gave the team a 5-win season as the 5th starter. That wasn’t enough for the Nats though; committing $210M on Scherzer for the next decade or so, pushing Roark to mop-up guy/insurance starter for opening of 2015. Manager Matt Williams also shook up the 2015 rotation order, installing the starters by accomplishment, not by reputation. Thus 3-year running opening day starter Strasburg is dropped to the #3 hole, and last year’s #2 Gonzalez is now basically the #5 starter. Enough about the MLB discussion though; lets get to the minor league rotations. All four full season minor league squads are announced here by Nats Journal. In some cases we know who the rotation will be, in other cases the below is a huge guess. Especially at Hagerstown (as we’ll see). A late spring training injury to Casey Janssen has called presumed AAA starter Blake Treinen into action in the Nats bullpen, perhaps for the long run. Which has opened up a couple of spots in the Syracuse rotation … and they’ve been surprisingly filled. Instead of installing who I presumed to be the 5th AAA starter (trade acquisition Felipe Rivero), the team has announced that 2014 MLFA signing/rubber-armed swingman Scott McGregor and 2015 MLFA Bruce Billings will fill out the rotation. Changes from 2014? 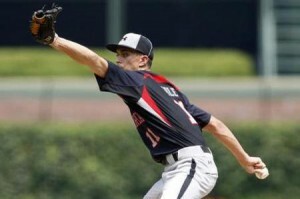 Rosenbaum traded for catcher depth, Tatusko to Korea, Poveda remains an unsigned MLFA, and Laffey signed a new MLFA deal with Colorado. One has to think that McGregor/Billings are temporary holds in the rotation until Treinen returns. The conversion of Rivero to the bullpen is more interesting; the team is rather short on lefty starters in the system right now (thanks to a slew of upper-end draft pick lefty starters failing in the past few years … ahem Solis, Purke, Mooneyham, Turnbull). As we’ll see later on, there’s nobody really that makes sense to supplant any of these guys as a starter from AA or XST. Harrisburg went through an awful lot of starters last year. 19 guys got starts, 15 of which were not just one-offs. From last year’s opening day, Schwartz got demoted after putting up a 7+ ERA and then hurt, Gilliam got hurt, and Purke had Tommy John surgery. By the end of the season, only Rivero remained in the rotation, though he spent a good spell on the D/L as well. Dupra got 12 starts and 24 appearances and was medicore (5.60 ERA), Poveda had great ratios (39Ks in 32innings) but an ugly era (5.34), and MLFA Kroenke was abhorrent (6.72 ERA). Returning for 2015 are Austin Voth, the 2013 draft pick who shot up two levels last year, and last year’s MLFA Paolo Espino, who has re-upped with the team for 2015. They are joined by newly acquired Joe Ross, MLFA Tim Alderson and the surprising Matt Swynenberg (who was closer to retirement than a rotation gig this time last year). I have 2015 MLFA Richard Bleier as a swingman/spot starter for now. This rotation may be augmented by some of the Missing/XST arms (see later discussion). Lots of turnover in the Potomac rotation as well; 14 guys got starts from last year. Dakota Bacus, Brian Rauh, and Matthew Spann are reprising their roles as starters from the end of last season, while two others (Dickson and Sylvestre) remain in XST limbo for now. What happened to the rest of these guys? Brett Mooneyham and Nick Lee posted ERAs of 7.36 and 10.05 respectively and were both demoted. Encarnacion was nearly as bad and was outright released by the organization earlier this past off-season. Luckily, we kind of already know that the opening day rotation is going to change: we know where two of the organization’s brightest arms are heading. Giolito and Lopez should supplant Bacus and Rauh, making for a rather formidable Potomac rotation. 2015 Rotation: AWilliams, LReyes, Van Orden … and then who knows. Orlan? Ullman? Well; Hagerstown’s rotation should be … interesting. When you look at the assigned arms, there’s only three clear-cut starters from last year. So clearly either the Hagerstown team will be getting reinforcements from the XST list or there’s guys being converted from 2014 relievers to 2015 starters. Pivetta and Giolito were the mainstays from last year; both will be in high-A at some point soon. Ott was flipped as a throw-in with the Steven Souza deal. Its hard to pass judgement on this rotation until we talk about those in XST. There’s a TON of arms who are currently unassigned. We’ll see how things go; I guess we could start seeing some minor league releases soon enough. With Tanaka’s injury, will Yankees come calling? Heard an interesting trade idea floated in Buster Olney‘s daily podcast last week while talking with Keith Law. In light of Masahiro Tanaka‘s possible season-ending injury further depleting the Yankees rotation (which is already without projected 2014 starters CC Sabathia, Michael Pineda and Ivan Nova and is depending on two 15th round picks who you couldn’t pick out of a lineup in Shane Greene and Chase Whitley right now), could the Yankees come calling the Nationals looking for Ross Detwiler in trade? Despite all their rotational issues, the Yankees at the All-Star break sit 5 games back of a weak AL East and just 3.5 back in the Wild Card. The Yankees don’t “pack it in,” ever, and have never shied away from spending to get what they need. They’ve already made one shrewd starter acquisition in Brandon McCarthy (traded for cash and ineffective starter Vidal Nuno) and look like they could now use another (Greene has looked ok, but Whitley has not, and the Yankees starting pitching depth in the minors looks pretty bleak). 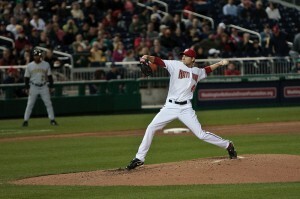 I’m on record saying the Nats should cash in on Detwiler. And I still am. My arguments are still the same; opportunity cost of an underutilized and replaceable pitcher versus filling a need for a team trying to mask issues at second base and a thinned farm system. And i’m not alone (Adam Kilgore in April and May on the topic, Thomas Boswell said that “Detwiler has been wasted” in his June 23rd chat). There’s now more than a few options for a Detwiler replacement in our system, a guy who can start or relieve, throw low-leverage innings in blowout wins or losses and still develop. In fact, I’ll bet that our most recent 40-man addition Taylor Hill would *love* that role right now instead of pitching in upstate New York (even if the Chiefs are in first place). If you wanted a lefty like-for-like replacement, look no further than Aaron Laffey, off-season MLFA who’s 11-3 for Syracuse on the season and who has 6 years of MLB experience starting and relieving. Heck, maybe the Nats can trade Laffey if they’re so committed to Detwiler; Laffey pitched briefly (and somewhat effectively) for the Yankees in late 2011. Why not see if the Yankees can give up something that the Nats could use? Minor league depth. Backup middle infielder. Something, anything. Detwiler, in the meantime, looks like he could be a nice fit in Yankee Stadium. Lefties mitigate the short-porch in right field there, and Detwiler’s sinking fastball sports a decent ground ball rate (45.7% this year, right in line with his career average of 46.5% but below his 50% figure the last year he was healthy and starting in 2012) that could help keep the ball in the park. (coincidentally … while googling for one of the links above, I discovered this link at the Washington Nationals Fan Forum: someone took my 5/9/14 article on this same topic and posted it there, where it got a ton of commentary. Well shoot; why didn’t those people come and comment here? I would have loved the discussion. I had no idea it was there. But the conversation continues today. I’ll post this link there and see what happens). We’re a month into the minor league season and nearly five turns through each minor league system rotation, so lets take a look to see how our starters are doing. As with the major league rotation review, I’ve assigned grade letters to roughly judge each start done by our minor league staff, and then i’ve tacked on their overall stats for context. Note that I generally give grades to those that get the starts in games, as well as those who pitch “starter length” outings. You’ll see this much more frequently in the low-A section, where Hagerstown clearly has a “two-starter” system going for many of its guys; one guy will throw 5 innings, then the next guy throws 4. So nearly the entire Hagerstown roster is getting “starter grades” right now. I should also caveat that this analysis is “scouting the box score” analysis; I’ve not had a chance to see any of these guys in person, so I can’t comment on the luck factor involved with anyone (stats versus ability) other than inference analysis between ERA and FIP. For each team I’ll list the current rotation as best as I can make it, then have a second section where we list the guys with spot-starts or who were in the rotation but are no longer (D/L trips, promoted, demoted, etc). Then we’ll discuss, and then list those guys who are pushing for promotions and those guys who are in jeopardy of getting demoted (or, worse, released). (Note: I wouldn’t be able to do this data tracking or this post without the great daily work by Luke Erickson at www.nationalsprospects.com.) All stats here are as of 5/2/14, which means I grabbed one May start’s worth of stats for a couple of guys here and there. A month in and the Syracuse Chiefs are mired in last place (though to be fair, only 3 games separate the entire division). Opening day starter Danny Rosenbaum is already on the D/L with a possible torn UCL, possibly the latest in an epidemic of Tommy John surgeries throughout baseball (there’s been at least 14 MLB pitchers to go under the knife for this already in 2014 and quite a few more minor leaguers; I have a draft post on this topic coming). His replacement in the rotation is journeyman and Ian Desmond-relative Josh Roenicke, who has struggled in his spot-start duties. However, Roenicke isn’t the least effective starter in AAA; that distinction goes to late spring training acquisition Omar Poveda, who has gotten pretty well battered so far in his four starts. 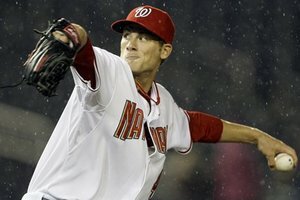 One of these two guys likely is making way for recently demoted Taylor Jordan (well, assuming Jordan even makes it to AAA anytime soon; Doug Fister‘s return is complicated by the Nats needing another starter in-between; Jordan likely is sitting in AAA limbo until tuesday 5/6, then will settle into the AAA rotation). Meanwhile, we’re seeing excellent springs so far out of Ryan Tatusko, Blake Treinen (albeit in a SSS thanks to his being bounced up and down out of the Nats bullpen), Aaron Laffey and especially Taylor Hill. 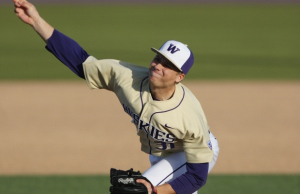 Hill’s excellent 29/4 K/BB ratio stands out, as well as his sub 1.00 whip so far in 5 starts. I think its fair to say that nobody expected him to have rocketed up the system like he has, given the fact that he was a college senior draftee with limited bonus and limited leverage. I think its also worth noting Tatusko’s production in a swing-man role; quite similarly to his trade-mate Tanner Roark, he continues to produce at an advanced/MLFA age … could he be another “found gold” pitcher in our upper farm system? We should also note that we have yet to see Brad Meyers, who remains on the D/L and has only thrown about 6 professional innings since 2011. The Syracuse bullpen has seen plenty of traffic to and from the majors: Aaron Barrett started in the majors and has seen time in Syracuse. Ryan Mattheus and Xavier Cedeno have already both been up and back. Nobody in the pen has much more than about 10 innings pitched, so we won’t make too many rash judgements. So far Christian Garcia looks decent; his 12/2 K/BB ratio in 10 innings is promising but he currently sits on the D/L with an unspecified injury. Meanwhile Daniel Stange has struggled with his control; he has 10 walks in 12 innings. We’ll talk more about bullpen guys deeper into the season. Most Deserving of a promotion: Hill and perhaps Laffey, both of whom are pitching dominantly right now. But neither are 40-man guys, and that (especially for Laffey) hurts him. Laffey as a starter in AAA has been great, but he might be more useful as a lefty-match up guy. Cedeno has been getting the MLB-bullpen covering call-ups but if Laffey was on the 40-man instead, it probably would have been him instead. Most in Jeopardy of a demotion/release: Poveda for sure; his cash-only acquisition isn’t looking promising considering that a rotation spot is needed soon for Jordan. Roenicke needs a couple of good outings to get his numbers up; with only 12 innings its hard to pass too harsh a judgement. But, with very little push from the current AA rotation, its hard to see a reason why the organization needs to make a move anytime soon (see the next section for more). Well, there’s not much joy in Harrisburg in terms of the rotation right now. The team is already 7.5 games out of first and is in dead last in the Eastern League. Four of the five starters in Harrisburg are, well, just awful right now. I should note that the stats above do include one extra start for Matthew Purke; it didn’t help his cause. Newly acquired Felipe Rivero has not acclimated well to Harrisburg, to say the least. Blake Schwartz has not adjusted well to the jump to AA after his excellent season in Potomac last year. The one bright spot seems to be A.J. Cole by ERA/FIP, but he’s still putting an awful lot of people on base (1.57 whip). Sammy Solis remains on the AA D/L, along with a handful of other long-serving names in this organization (Paul Demny, Rafael Martin and Pat Lehman). Zach Jackson already earned his promotion via 7 scoreless innings, though to be fair he really should have been in AAA to start (he’s a veteran minor leaguer and has been pitching at the AAA level for nearly a decade). Matt Grace is faring well thus far, as is Richie Mirowski, while Gabriel Alfaro needs to get his control under control (he’s got 9 walks in 11 1/3 innings). Most Deserving of a promotion: none of these guys are pushing for a promotion, now that Jackson is back in AAA where he belongs. Most in Jeopardy of a demotion/release: You have to think that Purke may be in jeopardy of being coverted to relief at this point. Alfaro was a MLFA signing out of the Mexican league and may not be long for the organization if he keeps pitching this badly. 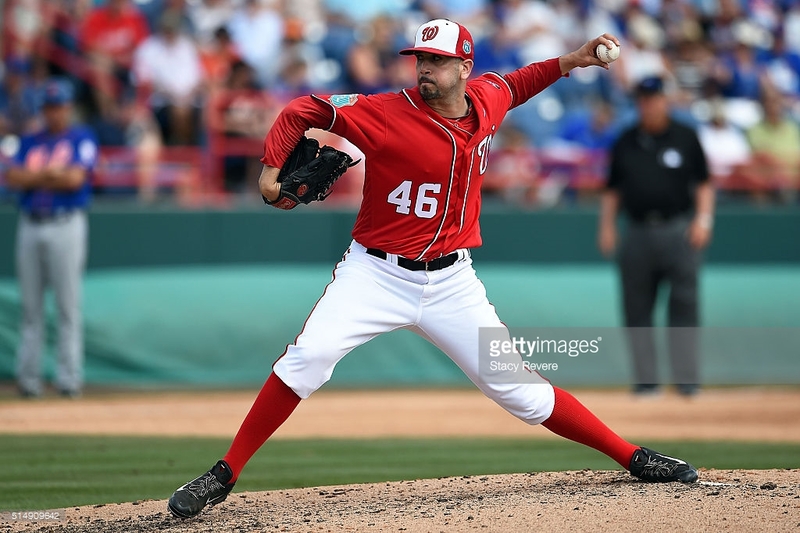 Gilliam was a throw-in to the Gio Gonzalez trade and is old for the level; he may get pushed out if someone from Potomac makes a case for promotion (which, thankfully for him, has yet to be the case; read on). Potomac is sitting in 1st place easily with the rest of its division struggling so far. But Its hard to see how they’re doing it with a rotation putting up numbers like this. The only guy getting starts for Potomac in April with a respectable/impressive FIP was Nick Lee, and he’s on the D/L. But even Lee’s numbers look completely weird: he had a 10 (ten!) ERA in his 14 innings, but an astounding 23 ks in 14 innings. His numbers are completely spiked by two successive awful outings and he currently sits on the D/L with an unspecified but hopefully short-term injury. Dakota Bacus earned his way into the rotation with a series of excellent long-relief outings; he replaces the also-injured opening day rotation starter Pedro Encarnacion, who himself struggled with his control (12 walks in 18 innings) before hitting the D/L. Otherwise there’s not much notable in the Potomac rotation to talk about: Brett Mooneyham‘s advanced numbers show just how bad he’s really pitched; he currently has a 7/19 K/BB ratio in 19 innings. He has more than twice the number of walks as he has strikeouts! That’s not a recipe for success long-term. Kylin Turnbull remains on the Hagerstown D/L, continuing to be a complete 2011 draft-day disappointment. The best reliever in Potomac thus far this season has already been bumped up; Brian Dupra posted a nifty 23/1 K/BB ratio and earned his way to AA. Robert Benincasa already has 5 saves with good numbers. Derek Self has great numbers and has given up just three base-runners in 10 innings thus far. So the Nats are getting some great relief. Gilberto Mendez hasn’t walked a guy yet and is one of the youngest guys in the league, so he’s clearly holding his own after posting a 0.91 ERA in low-A last year. Most Deserving of a promotion: Outside of Dupra, its hard to pinpoint someone that really is pushing for a promotion out of this squad right now. 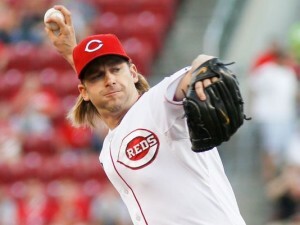 Bacus is pitching well but he’s just got a month of high-A experience; lets see how he does for a half season. I could see the late-inning crew of Self, Benincasa and Bryan Harper possibly getting moved up sooner than later. But none of the starters really are making a case for promotion right now. Most in Jeopardy of a demotion/release: Clearly for me the guy in trouble is Mooneyham; you just can’t be walking that many guys and have as little swing-and-miss capabilities to counter-balance your wildness. Before his injury, Encarnacion was struggling with his command too; I can see him back in low-A. Lastly Ronald Pena just is not fooling anybody right now; he’s got just 5 Ks in 20 innings and would be in more jeopardy if there weren’t other candidates ahead of him to replace at this point. Hagerstown is taking the South Atlantic league by storm, leading its division by 5.5 games already. And they’re getting some great pitching. The team clearly seems to be doing “combo starts” with some of its guys: that’s why someone like Wander Suero has as many IP as the 5 guys in the “rotation.” So, when it comes to judging starts nearly the entire staff in Hagerstown has “start length” outings to assign grades to. I like what I see out of Austin Voth so far, and Lucas Giolito is clearly holding his own in full-season ball (both these guys feature more than a K/inning, which is great to see especially out of the undersized Voth). Meanwhile we’re seeing some worrying wildness out of Jake Johansen, which will not quell the “he’s too big to be a starter so he’s destined for the bullpen” crowd. John Simms (11th rounder in 2012) and Matthew Spann (booty for the team’s sticking its nose into the David DeJesus waiver situation last year) have both already forced promotions thanks to excellent results. Otherwise there really isn’t much in the way of a traditional “bullpen” in Hagerstown to talk about. Most Deserving of a promotion: I’d say Voth and Jake Walsh, who older guys who are mowing guys down in Low-A and may need to be challenged by better/older hitters. Most in Jeopardy of a demotion: One of the older guys on this staff (Dixon Anderson) isn’t putting up the numbers he needs to be putting up as a college senior 2011 draftee in low-A. Youngster Nicholas Pivetta is also struggling with the jump to full-season ball out of JuCo and may be dumped back to XST at some point. But it should also be said that we’re kind of squinting for bad performances out of the Low-A squad; both these guys’ numbers are better than practically anyone in AA right now. Cole is holding his own and is the best AA starter right now, but again isn’t entirely pushing for a AAA promotion just quite yet. Solis has yet to appear thanks to a late spring training injury. Johansen has shown some wildness and not as much swing-and-miss stuff as he did in short-season ball. Purke has been awful and it may be time to move him to the Pen. Voth has been excellent and is probably the closest to a promotion. Jefry Rodriguez is in XST and didn’t make a full-season team. So far, I must say i’m a bit disappointed in the performance of the AA squad, but its great to see the promise of the Low-A squad. I’m slightly worried about how our closer-to-the-majors top prospect arms are looking; lets re-visit in a month and see how it looks.